2 out of 4 (50%) reviewers said they would recommend this vehicle to a friend. Extremely underpowered which might be good for this car considering how noisy it is at high speeds. Handling is terrible. Even larger cx-9 is slightly better so don't even need to compare cx-3. Bumpy ride and claustrophobic interior is extremely displeasing to motion sickness passengers. This is a muscular car with an imposing road presence. The looks are polarising and not to everyone's taste. I personally liked it but I doubt the styling is going to age well. The striking exterior presence is somewhat of a double edged sword. It looks athletic and is probably styled to look different from the pack but when you have hundreds or even thousands of c-hrs roaming the island on a daily basis, it quickly loses its visual impact. If anything it looks more like a high riding taxi. Like taxis, there are plenty of these on the road. Cars like the Mazda 3 are pleasing and have an age defying design language that is classy without coming across screaming, which means even though Mazda is one of the most popular models around it never overloads your senses to the point of nausea. The C-HR's gutless engine doesn't gel with its muscular looks, and I'm guessing its drivers largely belong to a segment that prioritizes form over function. It's not an SUV in any traditional sense. Boot space is not fantastic and ground clearance is average. The higher hip point is about the only characteristic that is more SUV-like. If you can look past its SUV and athletic pretensions this is a highly refined ride with a load of safety features. Build quality is good and there is a hint of lexus in there. Fuel consumption is fantastic, largely thanks to an underpowered engine. Overall, the c-hr does the job pretty well as a city vehicle, and I suspect that is enough for most Singapore drivers. Refined ride. Toyota's reliability. Good build quality and better than average interior. Gutless engine betrays its SUV pretensions. You're paying mainly for the looks, but design is polarising and may not age well. Too many c-hrs on the road screaming at you gets old really quickly. I got the 1.2 Turbo version recently from Borneo Motors and I must say I have never been happier. Considering the low COE, this is the best purchase decision I have ever made for now. Toyota's C-HR entered the market slightly later and at a slightly higher premium versus the Honda Vezel. While the Vezel made a national record for selling in a quantity as large as Xerxes' army, the C-HR stands strong as the elite Spartan counterpart. Spartan? No wait. Toyota Sense is standard on the C-HR and that means a whole lot of safety technology from auto engaging parking brakes, hill hold, dynamic cruise control, lane assists to blind spot monitors. I am actually wondering what was I doing without all these in the past. On the exterior - Edgy, masculine, fighter jet profiles with even a matching cockpit-canopy-stance sets it as a class above the Vezel. The C-HR turns heads everywhere - as it is a clear exit from the previous decade's signature curvy designs and an announcement into a new polygonal design dimension. Apart from engineering influenced trade-offs that lend the vehicle any bit of voluptuousness, the dominating box design cues would blend perfectly with stealth fighter colors and perhaps even dazzle camouflage. If not for motor shows, the C-HR would pass off on a catwalk as a work of Tobias Rehberger. This is definitely something you cannot park and walk away without looking back to have a moment. Always drive on Sport Mode. With all the safety tech & a superbly comfortable high ride lacking typical SUV body roll, the car is meant to be driven beastily. It provides what I feel is an invincible commandeering stance - one worthy of getting adopted by Sammo Hung. Because it is a 1.2T, it doesn't really fringe into hyperspeed territory nor set off speed cameras or red and blue chasing lights like its meatier hybrid counterpart. While turbo charged vehicles such as these would readily exude the spirit of borderlining insanity like A Team's Captain Murdock, the overwhelming safety tech adds layers of maturity and confidence for road-pilots. The C-HR has truly figured out the basics of a perfect Crossover. This is a car that will make heads turn. 2 things impressed me immediately when i drove the car, the dampers and the handling. Adding to its good looks, it is so easy to love in love instantly with it. It helps that accessories are so cheaply available online now. The car is designed to give much room for enhancement. Those that hate it, finds it already overly loud in stock condition. For me, the dual tone fits perfectly for the C-HR. Especially the black roof. This is a car that need a bright color. It is a total waste to go conservative with this car design. If you noticed, there have been sellers that let go of the car just months or a year driving it. Those that are disappointed are expecting an engine performance to match its aggressive look. This car, is made zippy for urban, it is tuned more for low and mid rev, it doesn't have the horsepower of a racer. So, this is NOT your GTR. The small window is surprisingly cooling, cheap to install your sola film. I got 3M crystalline for only $700. The looks, decent FC, handling, all the safety sensors! Noise insulation is poor, engine power is acceptable for city drive but not so for long trips.. Borneo Motors 17" rims are not suited for the car. Informtainment system forbids dialing and screen mirroring during drive. Its dumb. Need to bypass that check. Authorised Distributor Toyota cars are Toyota Alphard Reviews, Toyota Camry Reviews, Toyota Corolla Altis Reviews, Toyota Fortuner Reviews, Toyota Harrier Reviews, Toyota Previa Reviews, Toyota Prius C Hybrid Reviews, Toyota Prius Hybrid Reviews, Toyota Prius+ Hybrid Reviews, Toyota RAV4 Reviews, Toyota Sienta Reviews, Toyota Vellfire Reviews, Toyota Vios Reviews. Parallel Imported Toyota cars are Toyota Alphard Reviews, Toyota C-HR Reviews, Toyota C-HR Hybrid Reviews, Toyota Camry Hybrid Reviews, Toyota Corolla Axio Hybrid Reviews, Toyota Dyna 150 Reviews, Toyota Esquire Reviews, Toyota Esquire Hybrid Reviews, Toyota Estima Reviews, Toyota Estima Hybrid Reviews, Toyota Harrier Reviews, Toyota Hiace Reviews, Toyota Hiace High Roof Reviews, Toyota Hiace Mid Roof Reviews, Toyota Hiace Standard Roof Reviews, Toyota Hilux Reviews, Toyota Hilux Double Cab Reviews, Toyota Land Cruiser Reviews, Toyota Land Cruiser Prado Reviews, Toyota Land Cruiser Prado Diesel Reviews, Toyota Land Cruiser Utility Commercial Reviews, Toyota Liteace Reviews, Toyota Noah Reviews, Toyota Noah Hybrid Reviews, Toyota Prius Alpha Hybrid Reviews, Toyota Prius Hybrid Reviews, Toyota ProAce Reviews, Toyota Sienta Reviews, Toyota Sienta Hybrid Reviews, Toyota Tank Reviews, Toyota Vellfire Reviews, Toyota Vellfire Hybrid Reviews, Toyota Voxy Hybrid Reviews, Toyota Voxy Welcab Reviews, Toyota Wish Reviews. sgCarMart is the number one car site for buying Singapore cars, including new cars, parallel import cars, Toyota, Honda, Nissan, Volkswagen, Mitsubishi & BMW. 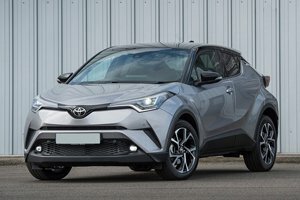 We have new car dealers comprising parallel importers, authorised car distributors, and used car dealers who have the New Toyota C-HR latest price Find new car pricelists, new car launches, new car promotions, new car reviews, latest car news & car articles. Read the New.Toyota C-HR consumer reviews to help you decide on buying a car. Also join our car discussion and forum discussion for car reviews, motoring news & motoring guides. Visit our partner sites who have job openings for Singapore jobs, Singapore classifieds, mover and real estate properties for sale.